Not long ago, P. asked me whether the verb clafoutir existed in French. I smiled. I found the question so sweet that just for a day, or two, I pretended that it did indeed. Wouldn’t it make sense, though? English as a language always seems to be much more flexible than stubborn old French? Words come and go so much more easily. Anyway, I know what you’re going to say. Yet another clafoutis! Well, I’ll have to apologize. But then, it’s really all we’re having for dessert at the moment. It serves the purpose just fine. And we are quite all right with it. In fact, it’s pretty good this way. In view of our life right now, that we’re still able to enjoy a dessert that brings the sweet touch, you know, what we want after dinner, what we need after dinner after too many hours hunched over the computer, busy finishing up the cookbook. I am getting there! I made this clafoutis a few times over the last few weeks, varying the fruit. In this one, I liked to combine fresh strawberries and rhubarb stewed with orange zest. It’s seasonal, and always a winning association. Then, I mixed eggs with sugar, milk and coconut milk, almond flour and cornstarch. Baked for 25 minutes and ate them lukewarm dusted with confectioner’s sugar. A lovely every day dessert, simple and straightforward. Lulu will have to love clafoutis as much as her papa and her maman. Sinon! (or else) But right now, she’s only all about carrots and sweet potatoes. It has to start somewhere! On another note, I’ll be speaking this coming Sunday, at the Food Styling and Photography Conference happening at Boston University. I hope that I’ll be able to meet some of you, and that I’ll be all right! Oh boy! Wish me luck! To make the rhubarb compote, combine all the ingredients in a pot and bring to a boil. Reduce the heat, cover and simmer until the rhubarb is soft. Let cool. Cut the strawberries into 4 pieces each; set aside. Preheat the oven at 350 F. Butter four 1-cup ramekins; set aside. In a bowl, dissolve the cornstarch in some of the milk. Whisk until homogeneous and set aside. In another bowl, combine the eggs with the sugar, and beat for 1 to 2 minutes. Add the vanilla seeds, orange zest and almond flour. Mix well and then add the milk/cornstarch and coconut milk. 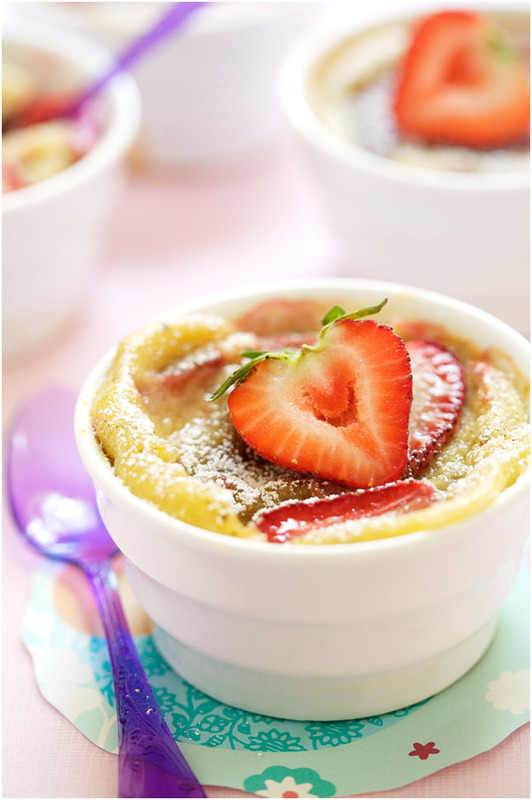 Drop 2 tablespoons of rhubarb compote in each ramekin and add slices of strawberries. Bake for 25 minutes. Let the clafoutis cool at room temperate and serve them lukewarm, dusted with confectioner’s sugar and extra pieces of strawberries. Je clafoutis aussi en salé! Perfect verb. We should have it. After all, crumble is a verb, so why can’t clafoutire be one as well? “You are such a Clafoutis” = You are so delectable….if that does not impress a date. A brilliant GF version. Thanks. So wonderful colors in that shot and really great lighting. Perfect! I have some left over rhubarb from a tart and I was trying to get some inspiration. All I have to do is get some strawberries. I love the photo and am sure it tastes as good as it looks! Also, great verb-creation on the part of your husband! Growing up (mom is French, dad is American), my dad would make similar comments about words that should be verbs in French. ‘Tis the season to clafoutis! I’m making strawberry-rhubarb strudels today . If I have any leftover fruit, I’ll make your clafoutis for my guys. It’s a favorite in our home too. Good luck this weekend! “macaronner” est bien devenu un verbe… alors pourquoi-pas clafoutir? Il suffit de l’inventer! Ta recette est bien alléchante, elle change de celui que je fais (le lait de coco), alors j’essaie…. I have some rhubarb sitting in the fridge that I was wondering what to do with. This looks like the perfect solution! I love the addition of the orange peel to the compote. Your version is lovely. Good luck for your conference! I have some fresh rhubarb I need to use. Thanks for the idea. And good luck at BU! I am a long long long time reader of your blog and first time commenter. Those clafoutis sounds lovely and I’m going to try this particular recipe next week after I come back from Boston. I am super excited that I am going to the Conference and even more excited to be able to hear you talk in a seminar. Thank you! Love the addition of almond flour and coconut milk. I might just be crazy enough to try this over the grill (the only heating device I have for the next short while). MMMMM Great photo and beautiful recipe. I look forward to trying it! one can never have too much clafoutis bea. excited about boston! J’adore les clafoutis, j’adore la rhubarbe, j’adore la lait de coco : je me lancerais bien dans ta recette : donc, peux-tu trouver quelques minutes pour nous donner les quantités en g ou tout simplement à quoi correspond un cup, à peu près ? PS J’adore aussi tes photos. Encore une belle recette, et superbe photo! My husband asked me the other day why my sister and father kept calling our 2 month-old daughter an onion. It took me a minute to understand that he had been hearing mignonne… On a bien rigolé. That looks scrumptious. I like the use of coconut and almond. I know this must sound very redundant, but the photos are delightful. Good luck.. wish I can be there when you speak :o(.. Your clafoutis look good, as always. Ne dit-on pas que les choses les plus simples sont les meilleures? J’aime bien les clafoutis et je ferai le tien aujourd’hui même avec les premières fraises de la saison rapportées hier du marché. J’ai déjà vu que le mot “clafoutis” viendrait du verbe “clafir” qui veut dire “remplir”… Mais j’aime mieux “clafoutir”, plus coloré à mon avis. Bonne chance à Boston! J’irais bien t’entendre mais c’est un peu trop loin de Montréal. Good luck at the conference! The clafoutis looks delicious. Your clafoutis looks divine! I l just love strawberry and rhubarb. The orange zest sounds like a perfect addition. Have a great conference! 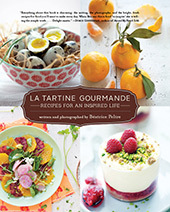 I can’t wait to hear you speak at the food styling and photography conference this weekend! Clafoutir!! très très bon! le verbe et le geste! This looks so delicious and I love the use of the seasonal veggies…yummy! Clafoutissons ensemble, ca sent l’ete! this sounds just delicious! as i sit at the computer eating leftover rhubarb raspberry crumble – just can’t get enough of summer fruit baking! have fun at the conference – wish we were going! What a perfect combo for a clafoutis! And it looks just gorgeous, too. Thank you so much for those GF tasty recipes! It is sometimes so hard to find easy and real GF recipes, that is a blessing for me these days! Bonne continuation et merci pour l’inspiration! You just reminded me of my poor effort of learning French last year. I couldn’t even remember how to conjugate verbs! This looks so yummy! Good luck at the conference…I’m sure you’ll do a great job! 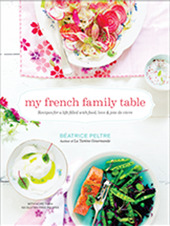 First off, I really love your food styling and photography! Keep it up! I wish I could be there for the conference. But, there’s no way for me to afford it as a poor fresh graduate now. So, I’m really looking forward to your post-conference write-up!! All the best and have fun there yea? Clafoutis — YUM!! I love this fruit combination. Looking forward to hearing your panel discussion on Sunday! Don’t be nervous, you’ll do great. I like the idea of pairing rhubarb with orange zest…. Oh yes, definitely a verb! My husband knows that!! It’s been breakfast too over here…incredibly easy to sustain one’s brains and vital functions with clafoutis. My mother used to make a cherry clafoutis baked it in a pastry shell…..I grew up believing that was what clafoutis was! have you tried this? is it regional? or did she invent it? your site is so lovely, congratulations and thankyou! Rhubarb and strawberries are on of my favorite combination’s!!! You were wonderful at the conference today! Such an inspiration to those of us who have thought about blogging but haven’t taken the plunge yet. Thank you for the lovely pictures and story. I am amazed by your photographs and your skill at making things look so colourful and vibrant and yet appetizing. You’re truly gifted, Bea! Many many thanks everyone. I think we should just consider that the word HAS to get into the dictionary. As to the conference, well, what fun it was! Was I nervous? Of course. But it’s done! Quelle belle photo appétissante ! J’ai tenté cette savoureuse recette Vendredi soir pour feter les fiançailles de ma soeur. C’était un vrai délice! Tout le monde s’est régalé :o) Merci! I only wish I could go to that conference! That would be so much fun! I just purchased a Canon Rebel XSi and am trying to learn all the settings and things it can do. I think I need to take a class because I am no professional. I wish I could get my pictures only half as good as yours! *Sigh* I just have the kit lens for now, but would like to get a macro someday. Is that what you use? What is the best setting for close-up food photos? I have much much to learn! I just love your site. Oh this looks so lovely and beautiful! I think your blog is fantastic.I’m wating your visit.Everythink delicious. What a pretty ramekin! Ohhhhh Lulu will grow up loving all assortment of food her maman makes for her! Just the best dessert in the world! I was lucky enough to hear you speak at the Food Styling and Photography Conference and I would like to say thanks for all the inspiration. I truly enjoyed hearing your story and seeing your imagery. What an amazing weekend full of information and talented people. Oh là là…Je frémis devant ce clafoutissement sympa! Et surtout de découvrir ce fabuleux blog. Quel talent!!! Wow et re-wow! Vos photos de boustifaille sont tout simplement parmis les + belles au monde. D’une web designer qui adore cuisiner…& qui saura ou aller puiser ses nouvelles recettes inspirantes! Je decouvre a l’instant ton website, et je suis epoustoufle! Et Billingue en plus! BRAVO! Je vis aux US, je travaille sur un projet en restauration. Je trouve tes photos vraiment magnifiques! Tu utilises un mini studio photos? Les fais-tu tois-meme? I made this last night – I couldn’t find almond flour so I used half spelt flour and almond meal – it was a little gelatinous but everyone loved it. The wheat intolerant guests and those who can eat wheat all loved it. Dear Bea I made this recipe today to take to work as it is my birthday on MOnday and I will be off, In the UK, you are the one ‘buy/bake’ the cake on your birthday. I made this because ifirst of all I fell in love with the ingredientes of your clafoutis. I had no strawberries so I had to use raspberries which is what I had in the fridge. I also had no rhubarb so i used some rhubarb and ginger jam. it turned out simply divine. thank you. No entiendo el rollo del verbo, pero si creo que este postre debe ser delicioso por lo sencillo de los sabores que contiene. Lo hare pronto.